Blue Origin, the space tourism company founded by Jeff Bezos, achieved a historic first when its New Shepard suborbital rocket successfully landed at the company’s West Texas facility on November 23. The suborbital rocket reached an altitude of 100.5 kilometers, released the unmanned payload capsule, and performed a powered descent, landing on the touchdown zone at 17:29 GMT, six minutes after launch. The company has developed a fully reusable, Vertical Takeoff and Vertical Landing (VTVL) space vehicle named the New Shepard named after the first United States astronaut in space, Alan Shepard. It consists of a pressurized crew capsule that can accommodate six people and a propulsion module. After launch, the modules separate in flight- the propulsion module performs an autonomous, powered descent and landing, while the crew module follows a suborbital trajectory, parachuting back to Earth. The propulsion module is powered by the Blue Engine-3 (BE-3), a liquid hydrogen–liquid oxygen (LH2/LOX) cryogenic engine that can produce 110,000 lb. (49,895.16 kg) of thrust at full power. It can be throttled down to as low as 25,000 lb. (11,339.8 kg) for powered vertical landings. The next generation BE-4 engine is being developed for orbital flights. The New Shepard capsule will be equipped with an escape system that uses a solid rocket motor to move away from the propulsion module rocket in case of anomaly. The New Shepard concept is not new. It was first introduced by the DC-X Delta Clipper, as the McDonnell Douglas single-stage-to-orbit vehicle was dubbed. 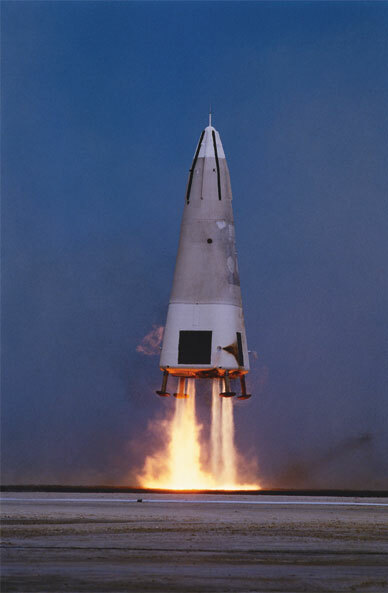 The DC-X, brainchild of Max Hunter who in the 1960s had promoted nuclear-powered spacecraft as an alternative to expendable rockets, was designed to take off and land vertically. On its first flight, at the White Sands Missile Range in New Mexico in August 1993, the DC-X powered four Pratt & Whitney RL10A-5 liquid-fuel rocket motors rose to 150 feet (45.7 meters). After hovering briefly it moved sideways 350 feet (106.6 meters), propelled by gimbaled engines. Then, with the engines throttled back to half power, the Delta Clipper descended and landed on its tail. The DC-X made three flights before being transferred to NASA’s Reusable Launch Vehicle program. In 1996, a new and improved model called DC-XA with lighter fuel tanks and an upgraded control system embarked on a series of flight tests, On June 8, 1996, the DC-XA flew for 142 seconds and reached 10,332 feet (3149.2 meters). But on July 31, 1996, due to a maintenance glitch, one of the four landing struts failed to extend at touchdown. The vehicle tipped over and was consumed in a fire fueled by the liquid oxygen oxidizer. NASA cancelled the program due to lack of funds. The latest success is the result of a decade of development and testing, beginning with the first flight in 2005 of a test vehicle called Charon, powered by by four vertically mounted Rolls-Royce Viper Mk. 301 jet engines. Charon was developed to test autonomous guidance and control technologies and made its only test flight at Moses Lake, Washington on March 5, 2005. It flew to an altitude of 316 feet (96 meters) before returning for a controlled landing near the liftoff point. It was followed by the flight test of the first development vehicle, Goddard, a sub-scale version of the future New Shepard. After two more test flights of Goddard proved to be successful, the propulsion module and crew escape system were tested. There were failures along the way, such as the automated destruction of a test vehicle. 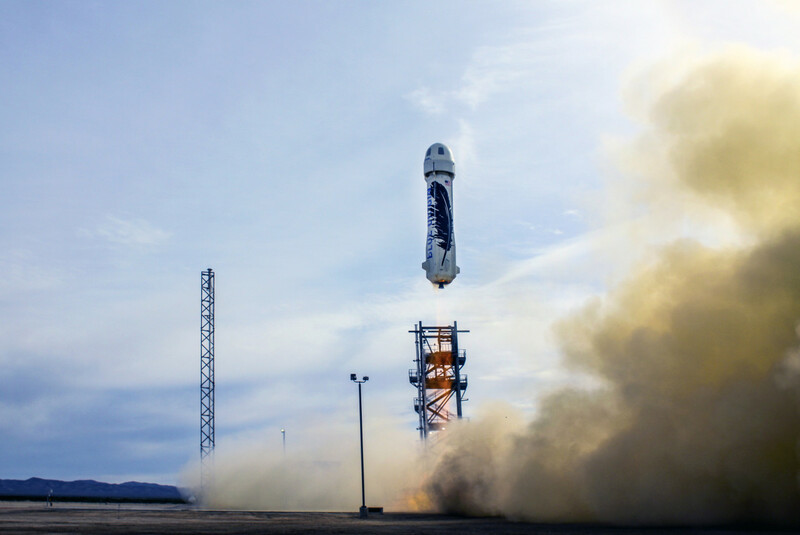 Although every test didn’t proceed smoothly, the company stuck to its incremental development process, leading finally to the first development test flight of New Shepard in early 2015. The vehicle experienced a nominal launch and ascended to an altitude of 93.5 kilometers. The unmanned crew capsule separated and parachuted back to Earth. But the booster reentry and landing failed due to loss of pressure in the hydraulic system. Eventually, on 23 November, 2015, the New Shepard became the second commercial space vehicle, after Scaled Composites SpaceShipOne, to successfully reach sub-orbital space, and return to Earth safely. Unlike SpaceShipOne that is air launched, the New Shepard is self-powered from the ground. The BE-3 engine launched the vehicle to a top speed of Mach 3.72. The unmanned crew capsule separated from the propulsion module and safely parachuted to the ground. Hydraulically actuated fins steered the vehicle through high-altitude crosswinds to a location 1500 meters above the landing pad. Then the engine re-ignited to slow the propulsion module as the landing gear deployed, touching down at a final velocity of 7 kmph.